Jupiter's moon Europa, as seen by NASA's Galileo spacecraft. NASA will announce new findings about Jupiter's ocean-harboring moon Europa during a news conference at 2 p.m. EDT (1800 GMT) on Monday (Sept. 26). "Astronomers will present results from a unique Europa observing campaign that resulted in surprising evidence of activity that may be related to the presence of a subsurface ocean on Europa," NASA officials wrote in a media advisory Tuesday (Sept. 20). The new information comes courtesy of NASA's Hubble Space Telescope, agency officials said. You can follow the news conference live here at Space.com, courtesy of NASA. Astrobiologists regard Europa as one of the solar system's best bets to host alien life. The 1,900-mile-wide (3,100 kilometers) moon harbors a huge ocean of liquid water beneath its icy shell; furthermore, astronomers think this ocean is in contact with Europa's rocky mantle, making possible all sorts of interesting chemical reactions. Tuesday's media advisory offered no further details about what the researchers will announce on Monday, but the involvement of Hubble raises the possibility that Europa's elusive plumes may finally have been spotted again. In December 2012, Hubble detected what appeared to be plumes of water vapor extending about 120 miles (200 km) into space from Europa's south pole. 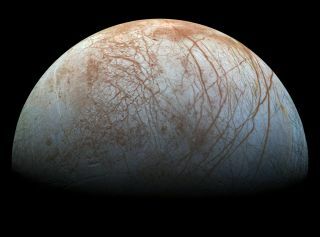 This news, which was made public in late 2013, caused a great deal of excitement in the astrobiology community, because it suggested that a robotic probe may be able to sample Europa's ocean without landing on the moon's surface. The detection team has been eyeing Europa with Hubble extensively since that initial observation, but to date they have not been able to confirm the existence of the plume.